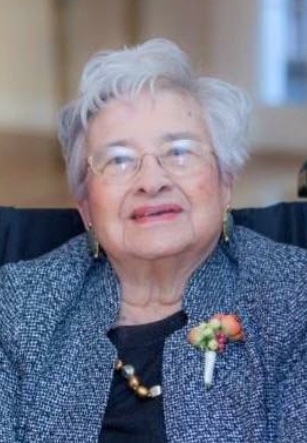 Narcisa Margarita Monreal Espinoza, of Tempe, Arizona, died Tuesday, December 4th, 2018 at Hawthorn Court Memory Care Facility in Phoenix, Arizona, after a long battle with Alzheimer’s Disease. Narcisa was born with her twin sister on February 28, 1923 in Winkelman, AZ. Narcisa is survived by her three children, her son Thomas M. Espinoza and his wife Janice M. of Tempe, AZ; her daughter Cynthia Burkart Espinoza of Tempe, AZ; her daughter Elizabeth A. Geist and her husband Christopher C. of Phoenix, AZ; eight grandchildren; fourteen great grandchildren; and one great-great granddaughter. She was preceded in death by her parents, Vicente and Margarita, her sisters Josephina, Maria, and Sophia, and her husband of 57 years, Jesus Baca Espinoza in 2002. She married her high school sweetheart, a Sea Bee in the U.S. Navy, in 1945 during WWII. She received her Bachelor’s degree in 1967 and a Master’s degree in 1972, both from Arizona State University. She had a lifelong career in civil service at Williams Airforce Base during WWII in 1942. She then moved on to the Bureau of Indian Affairs and then the Equal Employment Opportunity Commission (EEOC), both in the Phoenix, Arizona area. In 1979 she was offered a promotion with the Housing Department of Health Education and Welfare (HEW) which today is Health and Human Services (HHS) Baltimore, MD/Washington D.C. area. She retired from the Federal Government in 1983 and moved back to Tempe, AZ where she became an award-winning realtor and a substitute teacher in her eighties. Narcisa was proud to be an Arizonan and was diligent in tracing family roots. She discovered that her ancestors settled in the Arizona Territory generations ago and that they were considered a Pioneer family. She was very active in Tempe, AZ affairs, including the Tempe Historical Museum and as a founding member of the Tempe Tardeada. A visitation will be held on Monday, December 10, 2018 from 5:00 pm to 8:00 pm, with a Recitation of the Holy Rosary at 7:00 pm, at Richardson Funeral Home, 2621 South Rural Road, Tempe, Arizona. Mass of Christian Burial will follow on Tuesday, December 11, 2018 at 10:00 AM at Church of the Resurrection, 3201 S Evergreen Road, Tempe, Arizona. Interment will follow the funeral mass at St Francis Cemetery, 2033 North 48th Street, Phoenix, Arizona. A Celebration of Life reception will follow at Church of the Resurrection. Richardson Funeral Home, Tempe, Arizona is compassionately serving the family.